New Delhi, Mar 08, 2018 : The Rajya Sabha on Thursday saw a chorus for the passage of Women’s Reservation Bill with MPs cutting across party lines voicing their support for the cause. Chairman M Venkaiah Naidu reminded the government and parties to work towards unfinished agenda of empowerment of women in all walks of life. Giving a break to frequent disruptions since the start of second leg of Budget Session, MPs joined the discussion in the morning session celebrating the International Women’s Day but soon after it ended, protests by Opposition MPs made a re-entry. Women lawmakers from External Affairs Minister Sushma Swaraj to senior Congress MP Ambika Soni to DMK’s Kanimozhi among others were joined by Leader of Opposition Ghulam Nabi Azad, Trinamool Congress’ Derek O’Brien and CPI’s D Raja in raising concerns over crime against women and the need for passage of the Women’s bill. 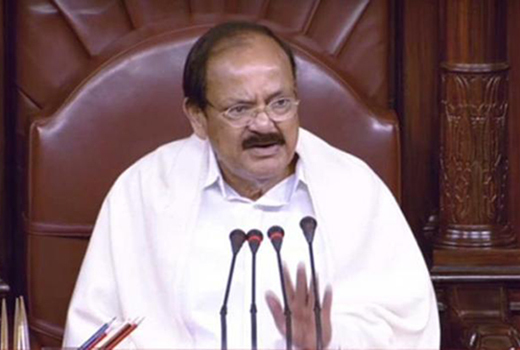 Listening to the discussions where the demand for 33% reservation for women in legislatures was raised, Naidu quipped, "all of us should join together to see to it that the unfinished agenda of empowerment of women in all walks of life are taken care of by the government and parties. I hope initiatives will be taken from the government side to take this forward and see to it that the aspirations of the people, particularly, women are fulfilled." He said he was of the opinion that a mere bill will not suffice. "Bill should be followed by (political) will and (administrative) skill. And then if you go for a kill of the evil, then you would be successful." Swaraj said she has been a votary of the bill and even today, fully supports the pending legislation while Kanimozhi said, "it is one bill which nearly every party supports. But we cannot still pass it (in Lok Sabha). It is a shame on all of us. We passed that bill over here after so much of struggle...We request the government to pass the bill because we cannot continue passing bills without women here." Like nominated member Anu Agha, who objected to tokenism on International Women’s Day, Kanimozhi also said it was time for women to say enough of that. "We don’t want to be celebrated for our sacrifices, we don’t want to be celebrated for what we give up. We want to be celebrated for what we are, we want to find our identity, our individuality and we want to pursue our dreams." In Lok Sabha, Speaker Sumitra Mahajan recited a poem she wrote on the occasion and soon after the Lok Sabha was stalled over various issues.